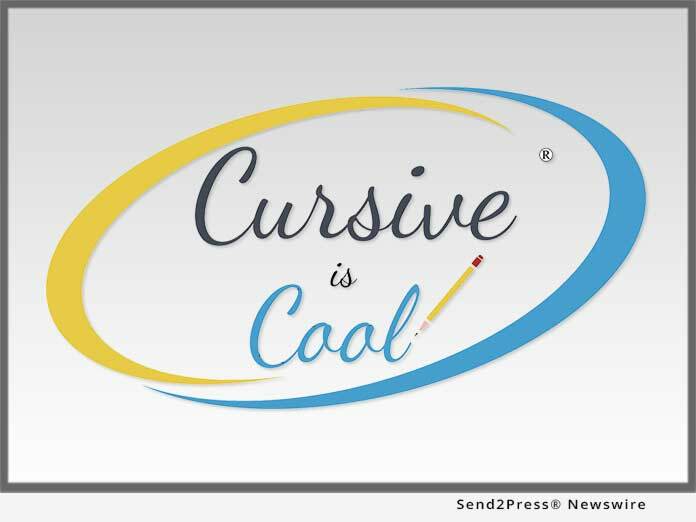 LOS ANGELES, Calif., Jan. 23, 2018 (SEND2PRESS NEWSWIRE) — Cursive writing continues to enjoy increasing appreciation in the United States and around the world, and the annual Cursive is Cool® contests for 2018 are launching on the 41st anniversary of National Handwriting Day, celebrated around the world on Jan. 23 each year. Presented by the Campaign for Cursive®, a committee of the American Handwriting Analysis Foundation, the date is associated with the birth of John Hancock. Due to the increasing popularity of the cursive contests, a FAQ (Frequently Asked Questions) page has been created to help parents and students as they get ready to write their entries. Entries for each contest are different: in the USA, entries must be emailed this year to make the process more efficient. Campaign for Cursive® offers three contests: one in the U.S. and two in Canada (one for English writers, one for French). Grade 1-6 students have the chance to test their cursive skills. Both contests have a deadline of March 4, 2018. Winners of the contests will receive fun new writing instruments, workbooks, learning methods and accessories. Supporters of the contest include the American Handwriting Analysis Foundation, Amsterdam Printing, Cursive Logic, Dixon Ticonderoga, Eeboo, Fahrney’s Pens, Fundanoodle, Laywine’s, New American Cursive Penmanship, Pelikan, PEN World, Sakura, Staedtler, and ThinkBoard. A new sponsor this year is specialty pen manufacturer Retro 51. Contest judges are handwriting specialists and educators. Entries will be scored for legibility plus quality. Awards will be given for most creative answers as well. Winners will be notified in April and posted to the organization’s social media channels. For more information, please contact Gayna Scott, Chair of Campaign for Cursive® at gayna@comcast.net. The American Handwriting Analysis Foundation is a 501-(c)6 non-profit business organization, chartered and incorporated in California. Dedicated to the advancement of the handwriting sciences, AHAF promotes education for handwriting examiners at all levels of expertise and from all schools of thought. For more information, visit: https://www.ahafhandwriting.org/. "We love hearing from the kids about why they like to write in cursive, we get some amazingly creative entries," said Gayna Scott, Campaign for Cursive chair. "Having our kids learn this lifelong skill is worth the 15 minutes a day to learn modern cursive." Founded in 1967, The American Handwriting Analysis Foundation (AHAF) is a nonprofit organization dedicated to the advancement of the handwriting sciences. AHAF promotes education for handwriting examiners at all levels of experience and from all schools of thought. The American Handwriting Analysis Foundation is a 501(c)6 non-profit business organization, chartered and incorporated in California.